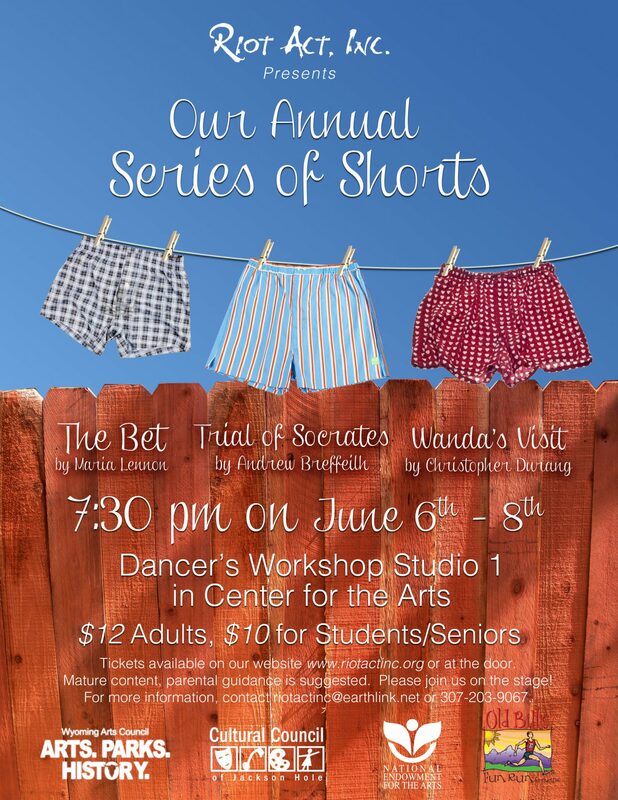 Jackson, WY – Riot Act, Inc. presents our Annual Series of Short Plays June 6-8 at 7:30pm nightly in Dancers’ Workshop Studio 1 in the Center for the Arts. Tired of the gray skies and rainy days? Need some comedy and live action? Join us for our Annual Series of Short Plays. This year we have three wonderful plays for your delight. Two of which are written by local playwrights. The Bet by Maria Lennon (local playwright), directed by Deborah Supowit. Sarah married to Andy and Helen married to Peter, as couples lay down a bet. A very social couple, Sarah and Andy must spend an entire weekend alone together. A very urban couple, Helen and Peter must spend a weekend away from any modern conveniences. Set in a cabin in the woods, this show is a comedy of errors. The cast includes Kari Hall, Henry Raynor Williams, Vincentius Stevie, and Aly Harmon. Trial of Socrates written and directed by Andrew Breffeilh. So you think you’re going to see a show about Socrates? Think again. This play twists a theatre outing into a focus group. The cast Bernadette Cuvalo, Marlene Lang, and others. Wanda’s Visit by Christopher Durang, directed by Linda Rode. Married for over a decade, Jim and Marsha find themselves stuck in routine and a dull relationship. Unexpectedly, Jim’s old high school friend Wanda shows up and turns their lives up-side-down. The cast includes Brian Van Hattan, Stephanie Capps, Jessica Schiers, Henry Raynor Williams, and others. Tickets are available in advance at online at www.riotactinc.org or at the door. Tickets are $12 for adults, $10 for students/seniors. Short plays allow the audience to see several small bites of theatre in one evening. Mature content, parental guidance is suggested. Please join us on the stage! For more information, contact riotactinc@earthlink.net or 307-203-9067. *Project made possible by grants from Wyoming Arts Council/NEA, Cultural Council of JH, and Your Old Bill’s donations.